The Vision, Mission and clear foresight for a distant future to empower women of this under developed and under privileged tribal area of Sundargarh District in the state of Odishahas finally got a concrete shape after 37 years of establishment of this institution. Sri.PanalalAgrawal and Sarbati Devi, the two great visionaries of this area dreamed of to empower women of this region as they could not send their own daughter to a faraway place for higher education. The dream has become real and thousands of girls are getting higher education every year as the institution has become an important centre of learning for women of this District as well as other parts of the state. I am privileged and proud to present the IIQA and SSR to the Hon’ble Peer team of NAAC with my team who have worked day in and day out to give it a shape with all the information of the institution. 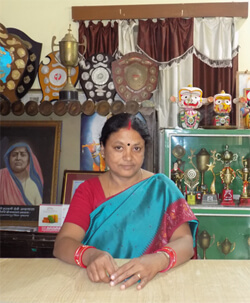 Prof. (Mrs.) S Mohanty The great philanthropist Sri.PanalalAgrawal dreamed of establishing a College in the name of his wife Madam Sarbati Devi to provide higher education to the girls of this tribal dominated area in the initial part of the eightees of last century. His noble vision became highly successful as the institution has turned out to be a great centre for learning of higher education in the Western Odisha. Sarbati Devi Women’s College is affiliated to Sambalpur University, Odisha having Arts and Science streams of the Degree Level with Hons in Economics, Education, History, Home Science,Odia, Political Science, Botany, Chemistry, Mathematics, Physics and Zoology. The College is recognized by UGC under sections 2f and 12B and receives UGC assistance. 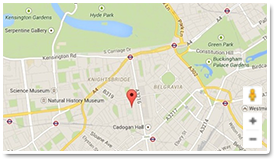 The College has a sanctioned strength of 1280 in both Arts and Science stream. The performance of our students is quite excellent in academic as well as co-curricular & extracurricular activities such as Cultural, NSS, NCC, YRC etc. The College is going for second cycle of Assessment and Accreditation by NAAC which has become mandatory for getting World Bank and RUSA financial assistance during the next five years. The NAAC Steering Committee has worked hard to prepare the IIQA and SSR since the month of November’ 2017 with their dedicated effort which is really commendable. Their work will continue till the time of the NAAC Peer team visits the College. I take this opportunity to express my thanks to the Principal, Prof. J Parida, who is the guiding spirit behind all of us. I express my heartfelt thanks and gratitude to all the members of the NAAC Steering Committee for their dedicated work. I hope and believe that NAAC Peer team will appreciate our sincere efforts in this respect. 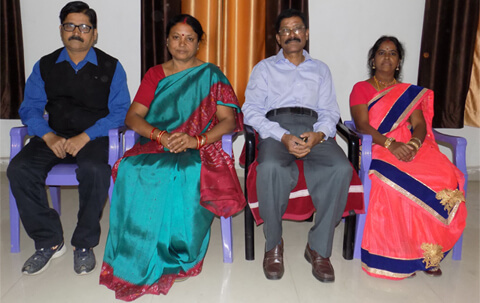 Prof. R K Mahapatra, Joint Cordinator, Prof. (Mrs.) M Tripathy, Member, Prof. (Mrs.) S Mohanty, Coordinator, Prof. J Parida, Principal, Prof. (Mrs.) N Mishra, Member,Mrs. P Santha, Data Templates Processing Officer, Prof. S K Panda, Member.